It is with great pleasure to introduce Tracey from Tasty Trix, she has an awesome blog, and can really cook in fact her recipes are often featured on food buzzes top 9, this dish looks fantastic one I will definitely try. 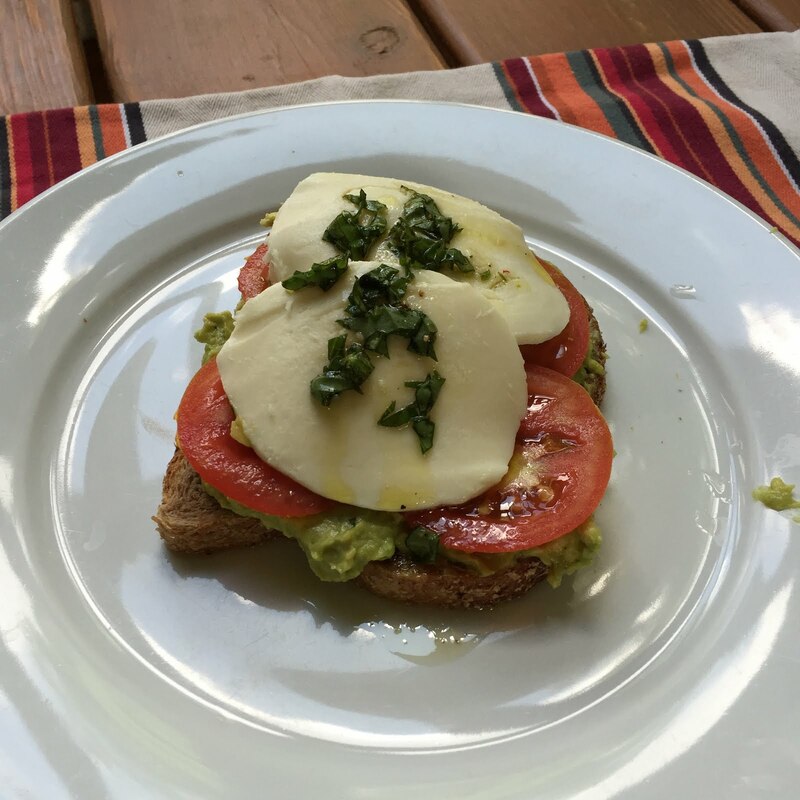 Its my mission to keep finding cool blogs and feature them on Chow and Chatter, so feel free to guest post anytime, its so much fun and such a delight to see recipes from around the world, to inspire us all to cook new foods! Anything! Well, that really got my mind racing. 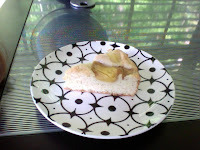 But after running through a zillion recipes and ideas – and rejecting each and every one! – I realized that all I really needed to do was present the kind of food I truly love. After all, one of the things that’s so great about Chow and Chatter is the obvious passion with which Rebecca approaches life, food, family, and friends. 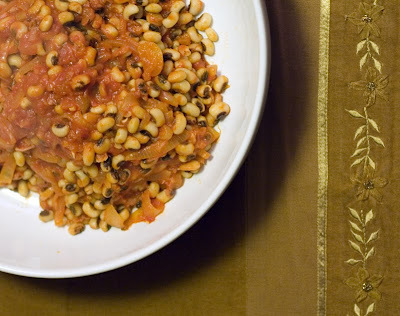 There’s also a wonderful diversity of cuisines and voices represented on her blog, and once I realized all this, my choice was easy: I’d write about red-red and kelewele, a traditional Ghanaian duo and one of my very favorite meals in the entire world. 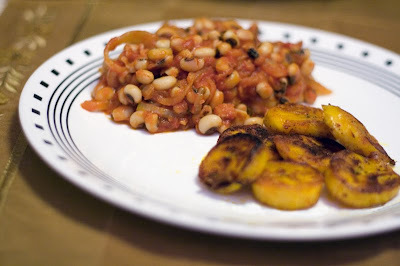 Red-red is a spicy stew of black-eyed peas; kelewele is an even spicier dish of crispy fried sweet plantains. I am not West African, and I’ve never (yet) had the opportunity to visit Ghana, but for some reason, the food speaks to me. When I eat it, I feel nourished in my body and soul; the flavors take me to a euphoric place. 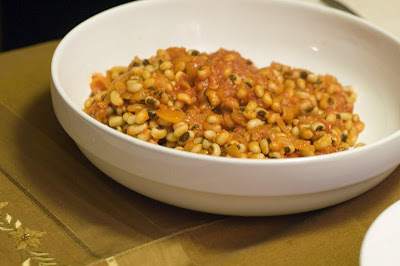 Beans with a starch is a staple of so many cultures, and there’s strong evidence to suggest that it all began in Africa. When you really start looking into it, in fact, the food of West Africa has had such a far-reaching influence on so many cuisines, that’s it’s a but surprising it isn’t more widely enjoyed in other parts of the world. I feel so lucky that I’ve had the chance to sample some authentic West African dishes at restaurants in Baltimore, Washington, DC, and at Benachin in New Orleans! But it doesn’t matter if you don’t have any Ghanaian restaurants near you – you can easily make red-red and kelewele at home! The genius of this food lies in the fact that so few ingredients come together in such a vibrant and utterly unique way. I really hope you’ll try it! Meanwhile, in a deep skillet, fry the onions in the palm and peanut oils until the onions begin to brown. Add the chilies and a dash of salt and stir another 5 minutes. Add the tomatoes and veggie bouillon cube, and simmer about 10 more minutes. Mash the mixture up into a sauce-like consistency and add the drained beans. While that’s simmering, you can make your kelewele. 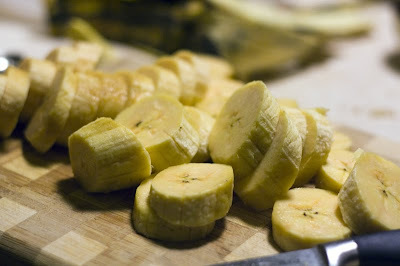 Slice the plantains into one-inch thick discs. Mix all of the spices and water together in a bowl, stir in the plantains and stir until they’re covered with the mixture. 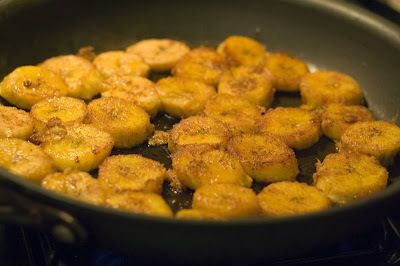 Fry the plantain slices in the oil until crispy and brown; about 5 minutes on each side. This meal is perfect with a cold glass of ginger beer! As part of the Foodbuzz taste maker program we get to experiment in the kitchen with food products, recently we were given a coupon for pepperidge farm puff pastry. I was a bit scared as I have never cooked with it before. 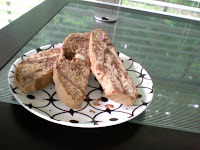 I just couldn't resist trying my hand at Salmon En Croute, using some lovely wild Alaskan salmon. I decided to make a filling with mushrooms and spinach with fresh dill and mustard, it was fun to make and delicious and I was so proud of myself. So next time you are really wanting to make something new go on give it a try you'll have a blast! 6. fold out the pastry and put the salmon in the middle with a spoon of the sauce on top, then fold the pastry around it, cut of excess pastry and seal with egg. Just out of the oven, they were huge definitely enough for 4 people! Galette also known as buckwheat crepes, are famous in the Western Region of France namely Brittany, they make a great easy to prepare snack, and often times were taken into the fields by the farmers. The list of fillings are endless, from ham and cheese, salmon, chicken, you can get very creative with them. Buckwheat is dark in appearance it is a rich source of protein, fiber and magnesium. It is also very filling. With the addition of the cheese and ham, you are getting protein and calcium. let it start to melt and fold the crepe around it. French Flour, we actually bought another bag before flying and I got this, Jams, and coffee! These are yummy, and really filling makes a great breakfast, lunch or snack, good anytime! I also love giving nuggets of health advice from the latest research I come across in a very easy to understand way. sharing life and travel with you all, its wonderful to make foodie friends around the globe! 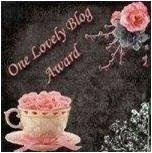 I will to pass it along to everyone, feel free to post on why you love blogging, I appreciate everyone of chow and chatters readers, your following and comments make my days bright and sunny! Buenos Dias! My name is Diana from A Little Bit of Spain in Iowa. I am so excited to be here at Chow and Chatter and want to thank Rebecca for allowing me to share a bit about who I am and a recipe on her wonderful blog. I have been following Chow and Chatter for some time and enjoy reading so many great posts filled with cultural recipes and always focused on nutrition and eating well! When Rebecca first asked me to guest post, I knew I wanted to share something special and unique to my Spanish heritage. I also wanted to share with you my passion for our local food movement and buying the best in hormone, antibiotic free meat from family farmers. Putting these two thoughts together, I decided to come up with a delicious Spanish stew using lamb shanks from my local family farmer, Cory's Country Lamb. This recipe uses many different flavours such as green and red peppers, tomatoes, garlic, red wine, and Spanish paprika. All cooked in different stages and simmered low and slow with the lamb shanks to create a warming Mediterranean stew that will leave you yearning to visit Spain! As Rebecca knows, I am an urban homesteader. I grow my own vegetables and preserve as much as I can before the snow arrives and the winter is upon us. 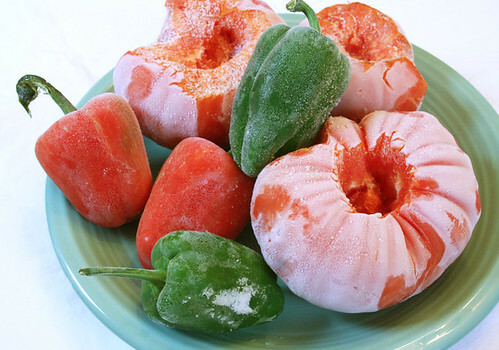 I freeze most of my homegrown tomatoes and preserve my peppers in a variety of ways, including freezing them whole and freezing them after I've roasted them. I love doing this as I have fresh, local, homegrown tomatoes and peppers to use during the winter resulting in some of the flavours of summer! For this recipe I also used turnips and their greens! Turnip greens are filled with nutrients from vitamin A, vitamin C, vitamin E, vitamin B6, folate, copper, calcium, and dietary fiber. Many people don't realize the nutrition within the greens and ask their family farmer to discard them, eeek!! Turnip greens are beautiful in stews and soups. I have found that different types of turnips produce different flavors in their greens. Some are more bitter than others. I have been enjoying these fall turnips with the purple tops which produce beautiful greens that are much milder in taste similar to spinach or swiss chard. 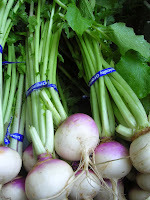 I also enjoy eating these turnips as they are great eaten raw in salads. They have a bitter crunch similar to a radish. When cooked down, they lose that bitterness and take on the warming characteristics of a cooked root vegetable. Soak 1 1/4 cups white beans overnight. Preferably, 24 hours. The first thing we are going to do is make a sofrito. In a large dutch oven, heat up 3 tbls of olive oil. Add the onion, garlic, red and green peppers. Saute until the onion is transparent and the peppers tender. Add the diced tomatoes and bring to a boil. Simmer for about 10-15 minutes or until the sauce has reduced by about 1/2. Empty the sauce into a bowl. Season the lamb shanks with salt, pepper, and Spanish Paprika. 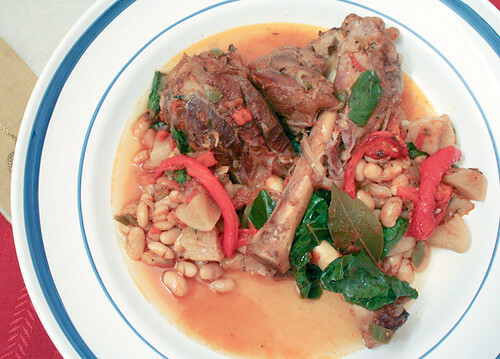 In the dutch oven, add a good drizzle of olive oil and brown the lamb shanks on all sides. For about 8-10 minutes. Once the lamb shanks are browned, remove and set aside. Add the sauce back into the dutch oven and over medium heat stir into the remaining brown yummy pieces remaining from the lamb shanks. Add the chicken stock, red wine, bay leaves, thyme, 1 1/2 tsp of Spanish paprika, turnips, and beans. Bring to a boil and season with salt and pepper. Add the lamb shanks, cover, and reduce heat to low. 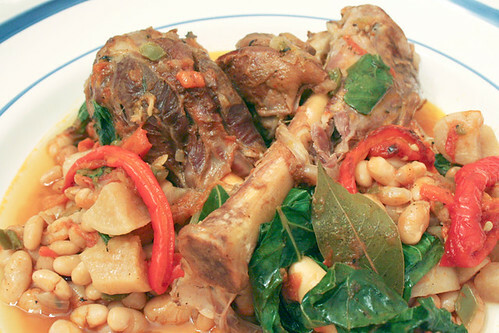 Simmer for 2 - 3 hours or until the beans are tender and the meat from the lamb shanks are falling off the bone! 10 minutes before they are finished, add the turnip greens. 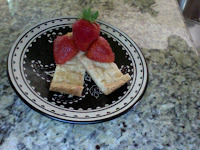 I hope you enjoy this recipe and learning a bit about me and my blog. Thanks again Rebecca, for having me! Besitos!! What are you thankful for? oh I don't even know where to begin, I thank God for my family, friends and good health. Also I am thankful for making so many lovely food blogging buddies and wish you a wonderful Thanksgiving. I have an adopted American family and we are going to their home tomorrow, I said I would bring something I saw these sweet potatoes on the Bitten Blog (New York Times) and knew this was the one, flavorful and not too sweet. The sweet potato is a rich source of Dietary Fiber, Vitamin B6 and Potassium, and a very good source of Vitamin A, Vitamin C and Manganese. You will also get protein from the black beans. puree a few cloves of garlic, herbs and cilantro in olive oil and mix. Its done, ready to take with us tomorrow! The first thanksgiving was in 1621 it was celebrated by the Pilgrims with the local Massasout Indian tribe to celebrate surviving many hardships and a successful harvest. The harvest was made possible by the Indians who helped teach the new settlers how to grow corn and local food items. The first meal consisted of fowl, deer donated by the Indians, cornmeal, fish such as cod and Bass, and possible turkey. 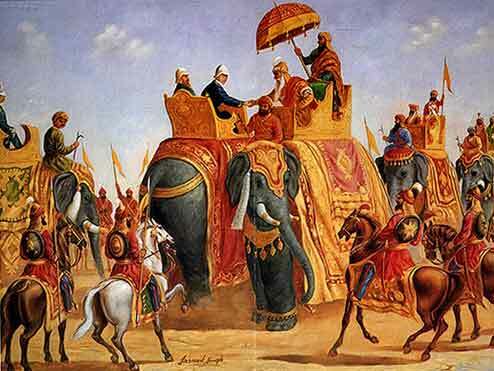 Although historians feel that it is more likely that turkey became the center piece of the meal later on. Other food that may have been eaten include lobster, rabbit, chicken, beans, squash, chestnuts, onion, leek, cabbage, carrot, eggs and goat cheese. Pumpkin pie and cranberry sauce was not on the menu as there was a dwindled supply of sugar and no oven to make the crust. Potatoes were also not on the menu as they were not culitvated at the time. The pilgrams didn't use forks just spoons and knives and a cloth to pick up hot items of food and they didn't eat a meal in courses, all the food was put on the table at once and it could be eaten as desired. The meats were roasted and sauces made with ginger, nutmeg, cinnamon , dried fruit and pepper. 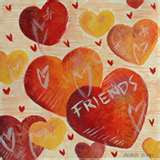 What ever you eat this Thanksgiving have a lovely day with family and friends Love from Rebecca of Chow and Chatter! We ate supper tonight at Nobles Grill Winston Salem, it is a famous high end restaurant in town, with a beautiful interior and great ambience and good service. Here's what we all ordered. Duck, our friend seems to enjoy this and the presentation is very good. My friends crab cakes, one thing I will say Nobles does very good crab cakes, my friend said they were pretty good and she is from Maryland! I ordered Poulet Rouge, it was a little organic chicken, cooked on a wood fire, over mashed potatoes with some brussel sprouts. Overall Nobles is a great place to eat, but pricey and I must confess after being in France we are spoiled by great food, this doesn't come close, and it leaves me feeling quite heavy. Where as in France I felt satisfied and light. I was twittering with the restaurant and the owner responded to me!, his food blogs are wonderful and he really is someone to look up to in the culinary world. 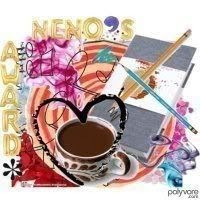 Anncoo kindly gave me a Mama blogger award this is very special to me, I want to pass this to Diana of A Little Bit of Spain in Iowa as I adore the way she involves her boys in the kitchen. Its my 30th birthday today, so I made a goodie from my childhood Australian Crunchie- (no idea how it got its name!) yesterday to treat myself. This was mine and my brothers favorite thing to make when we were kids. Its really easy to make and comes from the BE-RO cookbook an iconic British baking book by a flour company. It started to be published in the 1920's when self raising flour was introduced. The traveling salesmen would give it out at demonstrations!, and it is still going strong with over 38 million copies sold! 3 oz crushed cornflakes or any cereal, Jasmine didn't like the crushing part, but maybe when she is bigger and me and my brother loved smashing it up! then cover with chocolate, I used a cappuccino flavor! Jasmine taste tasting before going in the oven! Hope you enjoy it as much as we do, and its great to do with kids. I think we will all go out for dinner tonight then of to New York City next week with my Brother from London and friends to celebrate. Will also catch up with some more blogging buddies!